Anna Bolton | Greene County News A storm April 3 leveled a barn on State Route 72 near Fishworm Road in Cedarville. 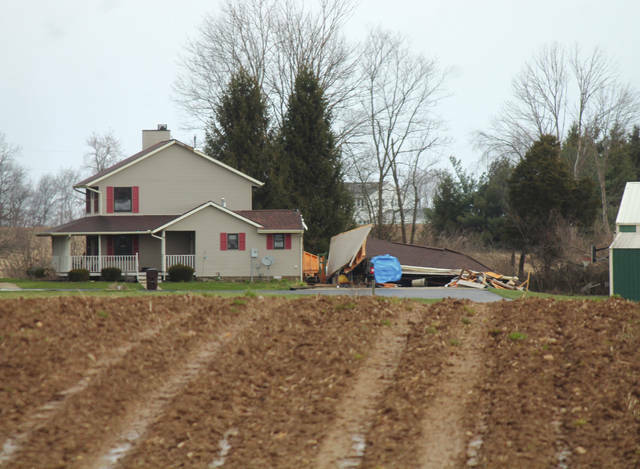 A house on Wilberforce-Clifton Road in Cedarville was mostly spared when strong winds destroyed its attached garage. 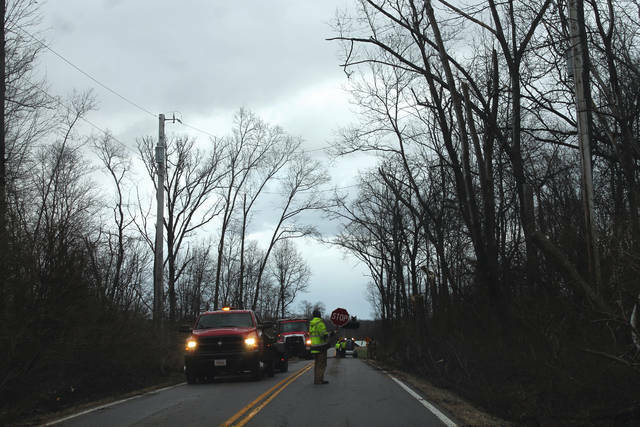 Crews clean up fallen trees on Wilberforce-Clifton Road, close to where Cedarville and Clifton meet. The storm uprooted trees and knocked down heavy limbs all along Wilberforce-Clifton Road and damaged this structure, too. The storm didn’t spare this evergreen or swingset in Cedarville. GREENE COUNTY — The National Weather Service in Wilmington confirmed a tornado touched down northeast of Beavercreek April 3 — on the anniversary of the 1974 F-5 Xenia tornado. NWS confirmed April 4 that the tornado, its rating not yet determined, was responsible for damage in eastern Beavercreek Township and western Xenia Township along Ludlow Road. Along with local emergency management agencies, the NWS survey team surveyed storm damage in north central Greene County to assess the nature of the damage caused by the severe thunderstorms, flooding and tornado(es) that moved through the area. 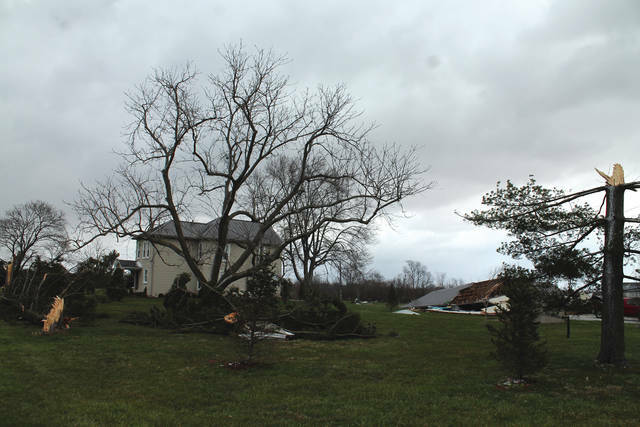 The storms — marked by strong winds and rain — damaged at least one home, leveled a barn and uprooted trees in the Cedarville and Clifton area, leaving branches, a trampoline and other debris strewn along country roads and fields by morning. The survey team also planned to assess damage in areas near Yellow Springs, South Charleston, Grove City and Canal Winchester. NSW confirmed tornadoes touched down southwest of South Charleston and in Grove City. The storms knocked down power lines, leaving Greene County with the largest number of outages, according to the Gazette’s partners at WDTN. The news outlet reported just under 900 customers were without power at 6 p.m. that evening. At 4 p.m. April 4, 204 county customers were without power, according to DP&L’s outage map, with crews still working to restore power to those affected. As of press time, a statement had not yet been issued for an initial conclusion regarding the nature of the storm damage, as the survey team continued its work. Results of the survey are expected to be completed and posted at weather.gov/iln. 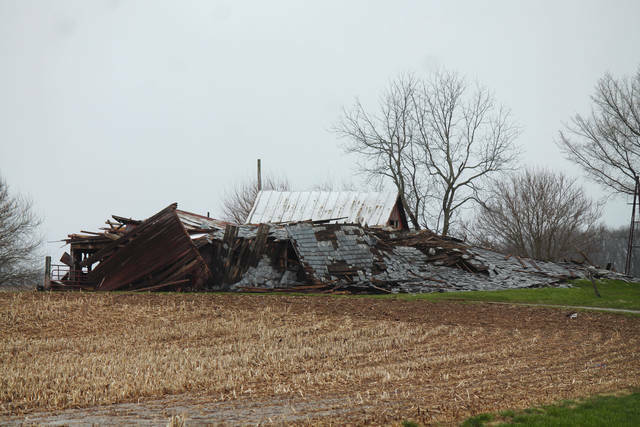 https://www.fairborndailyherald.com/wp-content/uploads/sites/50/2018/04/web1_Barn72.jpgAnna Bolton | Greene County News A storm April 3 leveled a barn on State Route 72 near Fishworm Road in Cedarville. https://www.fairborndailyherald.com/wp-content/uploads/sites/50/2018/04/web1_GarageWilberforceClifton.jpgA house on Wilberforce-Clifton Road in Cedarville was mostly spared when strong winds destroyed its attached garage. https://www.fairborndailyherald.com/wp-content/uploads/sites/50/2018/04/web1_TreeCleanupWC.jpgCrews clean up fallen trees on Wilberforce-Clifton Road, close to where Cedarville and Clifton meet. https://www.fairborndailyherald.com/wp-content/uploads/sites/50/2018/04/web1_TreesStructureWC.jpgThe storm uprooted trees and knocked down heavy limbs all along Wilberforce-Clifton Road and damaged this structure, too. 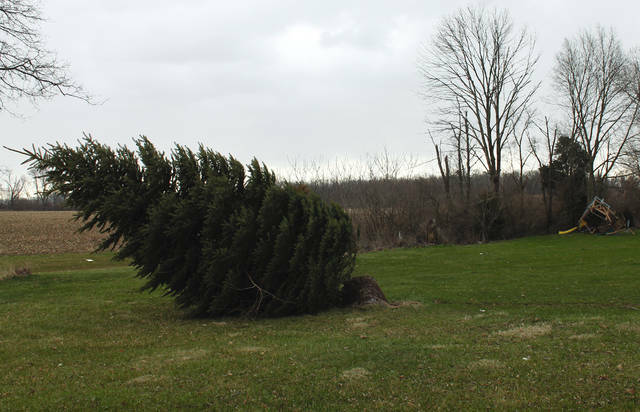 https://www.fairborndailyherald.com/wp-content/uploads/sites/50/2018/04/web1_TreeSwingsWC.jpgThe storm didn’t spare this evergreen or swingset in Cedarville.